MoeHaku 2010 paid host to a fair amount of official cosplayers to accompany the anime-themed cars, bicycles, motorcycles, and even a bus on display for public viewing. And as usual, it appears my loyal readers are on top of things, as I have a mountain of cosplay photos from the event! Thanks a lot guys! Unfortunately, one of the first photos that caught my eye was a character I am unfamiliar with. Anyone care to take a guess as to who this cute girl is? Thanks to 2chMod for sending this in! 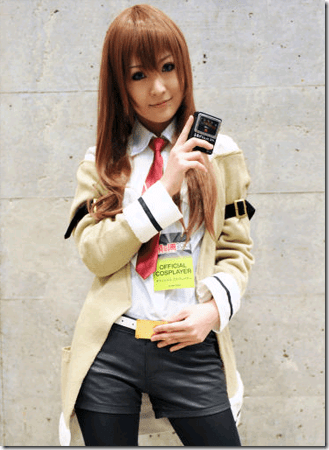 EDIT: Thanks to anon for mentioning she is Makise Kurisu from the Xbox game, Steins;Gate!